These enchiladas were delicious. It’s the key lime juice that made the difference. We will be having this more this summer. Pre-heat the oven to 350°F / 177°C. To make the enchilada sauce: Place the crushed tomatoes in a bowl. Chop 1 onion and add to the crushed tomatoes. Add 1/2 of the cilantro, chopped and 1/2 of the soy yogurt. Squeeze 2 key limes into the mixture and mix well. To make filling: Cut the tempeh in small strips or mince into small pieces. Clean the mushrooms and chop into small pieces. Chop the other onion and the green chilies. Add the onion and sauté until glassy. Add the mushrooms and cook until they begin to release their juices. Add the tempeh and chili pieces. Add the rest of the cilantro and the rest of the soy yogurt. 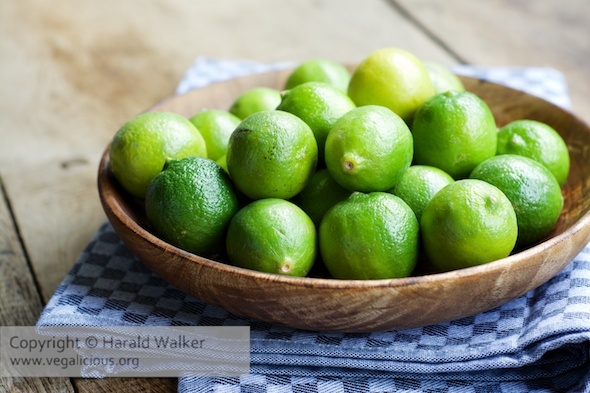 Squeeze the other 2 key limes to juice them over the mixture and stir well to mix. Fill each tortilla roll with some of the mixture and roll. Place the tortillas in the baking dish seam side down. 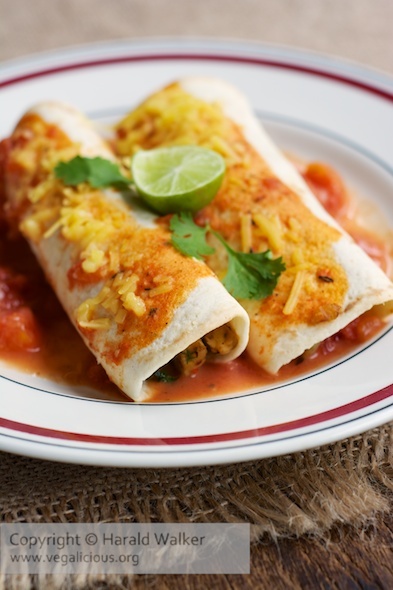 Spread some of the enchilada sauce over and sprinkle some of the shredded vegan cheese on top. We garnished the meal with a few cilantro leaves and a slice of key lime.. If you can’t get key limes, you can substitute with Persian limes. Posted by Chris Walker on July 8, 2014 in Lime, Main Dishes, Mushrooms.